Malware type scareware are increasing and have attained a high level of spread and infection globally, combining different methods of deception to the propagation process and using new domains. Below are some of them so they can be frozen and thus minimize the potential risk of infection. However, it's clear that this list represents only a small percentage of the huge volume of daily scareware that appears. The ability to manage botnets through http protocol appears to be a fundamental requirement for the developers of these web applications that work actively with the current crimeware. 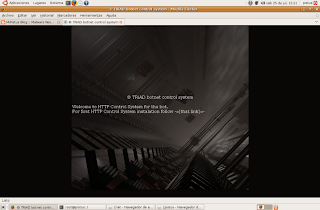 In this sense, another alternative is called TRiAD Botnet Control System, a remote control system for Linux platforms. 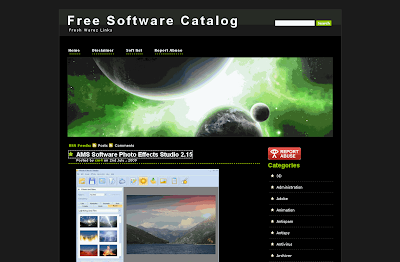 While this web application has a life span still too early (his first release dated 18 February 2009), and three versions are available with each possessing some interesting differences. But making a break for the moment on the technical aspects that has TRiAD botnet, one of the most striking factors that particularly presents this application (and in general his style) is made up of showy design, where the thought that lurks behind it would seem to mark the "style" of the author. Even the same approach appears to be present also in more sophisticated crimeware applications in terms of features and options proposed, that the above. Case ZeuS for example. Moreover, another feature that is perceived in the current development of crimeware of this style is the greater emphasis on optimizing the processes involved in the implementation of botnets, zombies control and administration. Where, without losing that first raised feature (design) of the application makes more "friendly" also presents simplicity with a minimalist style. But either way in terms of design, in the types of features they have or the cost of purchase, botnets and the army of zombie computers that have botmaster under his command are a potential danger and a heart attack via web difficult to stop at this time. In this case, it's the first version of a family of web applications, TRiAD Botnet (written in C), designed as botnets control systems that has an older brother named Hybrid, with the particularity of being designed to control zombies in Linux distributions. 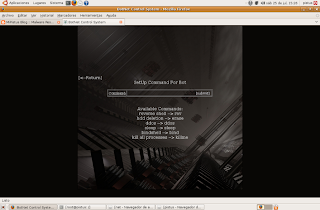 Although this version of TRiAD runs only on Linux, its later versions are multi-platform (Linux and Windows). Lets run only three basic functions of any botnet management: implementation of DDoS attacks, executing a shell and opening ports (BindShell), and notice the connection of a zombie (ReverseShell). From a structural standpoint, the magnitude of attack Distributed Denial of Service is concentrated in a file called dos.php whose information is stored in the file dos.txt. With respect to the BindShell through six commands only set you need to run a shell and leave a door open for botmaster available. 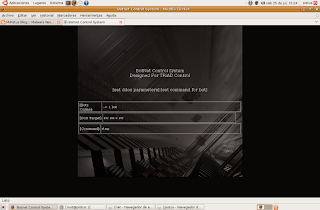 These commands are displayed in the screenshot that represents the module in question, which takes information from the file cmd.php reflecting the result in cmd.txt. The module ReverseShell reports every time a zombie is recruited and each time you establish your Internet connection. This information is stored on a small table showing number of active zombies, host IP address under attack and the command executed. Botnets are a serious problem for the security of any information environment connected to the Internet and the development of crimeware applications is increasingly high. Even in this case where the source code is free, there is a problem: any person with the knowledge necessary to manipulate the code and adapt/add functionality to the botnet. Still, although the development of crimeware not represent a deal for the creators of these applications, it does work in an industry with malicious objectives by expanding the range of alternatives designed to thicken other related businesses. Several years ago we have the ability to interact with different resources that are offered via web without using the resources at local level, our teams, for example, an operating system memory (eyeOS) that applied at the time, and applies this concept, as well as others we routinely use as Google Apps. However, at present this concept responds to a name that is setting a trend under the name of Cloud Computing offers a wide range of services that use Internet as a central infrastructure (the cloud). Where services are offered programs, is known by the acronym SaaS (Software as a Service). The point is that under this new phenomenon, the developers of malware were not on the sidelines and give rise to a new nomenclature that accompanies the concept of Cloud Computing, MaaS - Malware as a Service. Some months ago I mentioned an online payment service that allows malicious code to create polymorphic capabilities based on the famous trojan PoisonIvy called PoisonIvy Polymorphic Online Builder. Adding to this trend of offering services over the HTTP protocol, there are several alternatives as a service similar to the above, but free, called FUDSOnly Online Crypter, which channels its activity in the handling of malicious code in line with the intent to avoid detection by the antivirus companies, contributing to the cause pursued by malware developers to implement their creative processes anti-analysis. Basically it's a crypter. One type of program normally used to encrypt the binaries used in the distribution of malicious code. This "service" has the advantage of not needing to download or run the crypter of locally on the PC, but the entire process is carried out via web. 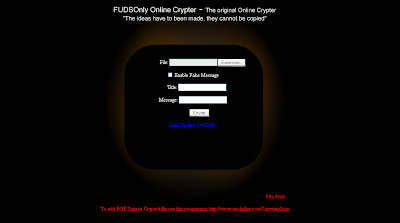 At the end of the process, the application returns the following legend "Your file has been encrypted without errors, Service offered by FUDSOnly. Click HERE to download." that has the link to download the file handling. As "extra", the "service" has the potential to insert into the encrypted file with the EOF crypter data (information server which is located at the end of file) for malicious code that doesn't support it, through a small program called ReEoF. This service offered to handle malware, has had a previous version that demonstrates that the concept had already been adopted by cyber criminals for quite some time. In fact, many services of this style that have been uploaded to the wave. The malware industry adds to the notion that agglomeration online services offered by the Cloud Computing, extending the possibility of danger and threats to continue with the daily bombardment that information against environments, seeking to broaden the offering criminal . After dealing with some emphasis on the activities of the most active botnets now, ZeuS, let's see a more detailed description of their crime. If we talk about malware and botnets, no doubt ZeuS has a particular advantage due to the amount of zombies that are part of its campus. ZeuS is designed to steal any information that is stored on the computers of victims remotely and carry out other attacks aimed at stealing information such as phishing. Therefore, we could say that ZeuS is a spyware, but also has capabilities for other types of malware such as backdoors, trojans and viruses. However, the author mentions in the installation manual that you don't like to call any of these forms in this crimeware, but will refer to it as a "bot software". Although we know the external face of ZeuS (the web interface management and control of zombies), has certain features that are constantly evolving and professionalize achieving greater flexibility and adaptability to ensure operation on different versions of Windows. This makes ZeuS a latent threat and very dangerous for any information system. In this sense, ZeuS also ensures performance "working" on the privilege level 3 (where the applications are) the operating system to avoid incompatibilities between the implementation of equipment and devices (which operate at lower levels). Though it may seem an irrelevant fact, this allows greater flexibility and hence a higher yield at the time of the fraudulent and criminal activities for which it was conceived. Monitor network traffic (sniffer) TCP. Intercepts the FTP and POP3 connections from any port. Intercepts HTTP and HTTPS requests from all applications that work with the library wininet.dll (eg IE). This demystifies the myth in which ZeuS uses a BHO to intercept applications through IE. Backconnect for all of the infected computer services (RDP, Socks, FTP, etc.). Get screenshots in real time. Ability to conduct phishing attacks. Constructor of the trojan that spreads and configuration file. Another technical detail is that all communication is done by ZeuS through a symmetric encryption algorithm (RC4). The server is the heart of ZeuS, and any botnet, and who is to obtain all records of infected computers that are part of the botnet and execute commands remotely. On the other hand, many botnets using virtual servers to their criminal operations. However, this plays against the botnet when is very large, if ZeuS, as usually, the virtual servers don't have too many resources, so it's customary for botmaster using dedicated servers to host the bot. This is an important fact to keep in mind during the research side. Accordingly, and as every application requires a minimum of resources to run satisfactorily, in the case of this botnet, the requirements are just to have 2GB of RAM and 2x frequency of 2 GHz CPU. As we see, the minimum requirements aren't at all a constraint VIP. Anyone can implement ZeuS, even without these minimum requirements. Furthermore, it's assumed that the computer is running an HTTP server with PHP (the language is generally develop these crimeware) and MySQL (to create the database with statistical information that shows your activity). Another requirement is Zend Optimizer, which is necessary to protect and optimize the scripts. With regard to updates, ZeuS is also can be "groomed" by newer versions without too much effort. During the last six months have been released five versions (based on each one approx. 35 days) with correction of errors, changes and new features, not the versions with smaller arrangements. A means a complete package of crimeware. B represents changes that cause total or partial incompatibility with earlier versions. C specifies error correction, added functionality, improvements, etc..
D is the number of refuds (changes) to the current version. This is just a screenshot of what can and ZeuS represents in terms of skills and maneuvers that have an environment within which criminal crimeware applications are the main actors. At the beginning of 2007 jumped from the darkness to begin a malicious code to be a source of important news because of their particular strategies of deception and a major campaign at the global level of infection that still remain a subject of research by the community security. This is Storm, aka Nuwar or Zhelatin depending on the identity assigned by the antivirus companies, although it's known as "storm", perhaps alluding to the manner in which systems ravaged by which he transformed into zombies, recruiting teams under the command of the botnet. At present, the threat posed Storm hasn't been to one side, but transferred to its twin brother, Waledac, which remains essentially the characteristic of trying to innovate in terms of apology necessary for the spread and recently has awakened after a period of hibernation. During virtually the entire 2007, Storm (the first appearances as a strategy of deception used to display a video on a storm unleashed in Europe) used as a means of propagation/infection e-mail with questions and topics varied inciting to click on a link embedded in the message body, which in some cases direction of a page (some of them also tried to spread Storm exploit vulnerabilities using iframe tags as resources) and others directed to the download of a binary in Storm both cases. Already for next year (2008), Storm joined the "surprise effect" linking the e-mail link provided to a web site that accompanied the excuse presented in the case of mail with an image alluding also to the theme that, the as in 2007, rotating with each major event (Valentine's Day, Independence of the USA, Christmas, etc). In addition, some variants spread through blogs. After several months of inactivity in terms of the spread of the threat, in January of this year appears Waledac, a trojan that uses the same mechanisms used by Storm and many security professionals are beginning to see the similarity between them. After several investigations, says that Waledac is, one might say, the twin brother of Storm. Using the same methodologies of Social Engineering with a broad portfolio of images and themes used as an excuse to capture users' attention. Passing through images rather the typical "love" for the month of Valentine Cases of alleged terrorist attacks, among others, to the recent course on a video on YouTube. There are, among others, two very interesting features in both Waledac Storm: the use of Fast-Flux networks and polymorphic capabilities on the server. The first of these threats were allowed to spread across different IP addresses and using different domain names that constantly rotate between each other with the name resolution. This causes, through a certain time to live (TTL) pre-configured every x amount of jumps between nodes (infected computers) from the same domain, you download a different prototype of malware. This leads to the second feature, the polymorphism. In this way, each time the package (malware) is established TTL attempt to download a different version of the malicious code to be "changes" every certain amount of time (also predetermined by the attacker) establishing capacity polymorphic. The diagram below provides the direct relationship, over time, the threat was used as a strategy of deception. Each of the zombies that are part of the botnet created by Waledac, focus your intentions in sending spam. In this sense, a very interesting extract from a report that says Waledac has the ability to send about 150,000 spam emails per day. Perhaps, then you know that Storm/Waledac are running campaigns with high rates of spread of infection globally and overcrowded, it's clear that their creators are continuing their criminal operations for a financial issue, which is nothing new for malware today. Más Waledac en acción ¿Puedes adivinar cuánto te amo gano? Malicious mechanisms used in both the propagation process and the methods of infection gradually evolve through crimeware developers are constantly tweaking their creations in order to increase their economy. This reality clearly realizes that the development of malware is a business where many "entrepreneurs" take the post on the subject releasing new viral market alternatives that actively participate in the automated generation of malicious code embedded self-defensive processes that cause a negative effect research and analysis of malware. Some time ago we talked about one of the crimeware applications of Russian origin so fierce was added to the portfolio of offerings that show, and represents, the underground trade of malware: malicious software family with polymorphic features of CRUM. Earlier this month, officially launched its creators, with fireworks, new version of its two stars crimeware applications CRUM Cryptor Polymorphic (v2.6) and CRUM Polymorphic Joiner (v3.1), both written in Delphi and ASM. The first is a "crypto" polymorphic, a program whose goal is to encrypt each file processed. In this case, encryption is through a random key of 256 bytes. At the same time, the malicious file is also subject to polymorphism in which each process is obtained in a separate file, which is equal to say ... a different malware. Perhaps this crimeware seem a bit trivial but polymorphism functionality makes it a very dangerous threat as the mutation that occurs in each of the files isn't superficial, doesn't change any time stamp but makes important changes in the modified binary completely its structure, forming in each process a new type of malware. As the younger brother of the family, CRUM Joiner Polymorphic, is designed, as its name implies, to merge (a concept adopted by the current crimeware) files regardless of extension and is in MASM32. Set options of functionality in the final file (folder housing, attributes, etc.). With respect to conditions of sale and use of crimeware, the author claims not to share the crypto and its components (this goes against the "business"), for commercial purposes (a clear contradiction) or submit it to analysis through online sites as VirusTotal (this increases the detection rate of binary). Requirements seem to be rather childish. The objective behind the development of these applications is to increase the life cycle of the malicious codes that are subject to malicious processes proposed by the application, adding anti-analysis features that hinder its detection and subsequent analysis by the antivirus companies. After a long period of inactivity, the creator (or creators) of the trojan Waledac, executed yesterday July 4 (U.S. Independence Day), a new campaign to spread using the same mechanism that characterizes Waledac and characterized Nuwar in time; Social Engineering. This time the excuse is Independence Day which is celebrated in the U.S. and the mechanism of propagation is the simulation of a video showing the alleged fireworks for the celebration of the special day. It's likely that this massive campaign to spread/infection ends with a fairly high rate of infection because the vector by which the threat is spreading is the email that respecting a characteristic of spam, massive, reaching millions users utilizing the computational power of the botnet comprising Waledac. We don't currently have any relevant characteristic that differentiates the mechanism of spread used on this occasion in relation to the above, perhaps the activity period is extended for a good while. Still, there are obvious analogies. 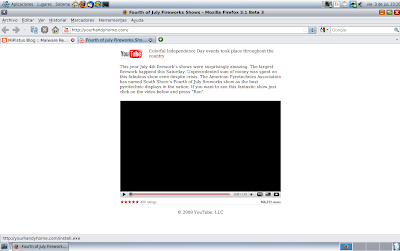 For example, continues to make use of BlackHat SEO techniques in the composition of domain names alluding to the excuse used by (firework, 4th, independence, happy, july, movies, video). Through the monitoring carried out this threat sudosecure.net since he was born under the name Nuwar can see this information graphically. 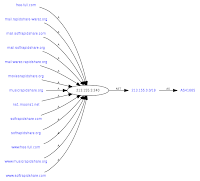 Similarly, we can visualize a lot of graphic information such as IP addresses involved in the dissemination of Waledac. In this case, the Top 10 and, considering that the campaign is focused in the U.S. (although this does not mean that the number of people infected is limited to the U.S.), it's logical to believe that the majority of infections are given in first instance in this country. On the other hand, continues to implement Waledac masking technique as Fast-flux techniques, using different IP addresses for the same domain. Waledac has emerged from the shadows once again turning its classic strategy that will continue to spread its campaign to spread/expand their botnet infection with the recruitment of more zombies. We have seen and mentioned at one point that the strategies used during the processes of malicious code spread more and more involved BackHat SEO techniques to achieve different vectors for access to download the file you are looking to spread malicious. Combined with Social Engineering and domain names with high demand keywords through search engines that refer to websites with a large and massive flow of use as Rapidshare, Megaupload and other related music, games, movies, etc., make as a whole, a very effective method of propagation. Currently it's carrying out a major propaganda campaign through websites that simulate the whole structure of blogging and use words much sought after and combined together to form the domain name to download malware using flashy BlackHat SEO techniques to achieve good search engine positioning. 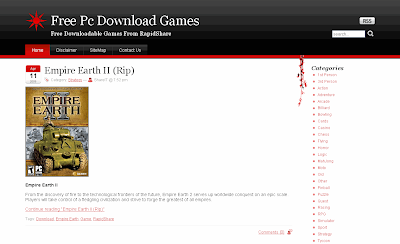 Among the words used are: rapidshare, megaupload, free, games, soft, warez, ftp, music, full house, pub, movies, cat, catalog, download. The search engine words or subjects that are part of the pages have a very powerful position, appearing, as in the example in the top positions. BackHat SEO techniques present a new approach to spreading malware that malware writers don't let the side, marking a trend and effective campaign and aggressive infection difficult to control through conventional mechanisms.